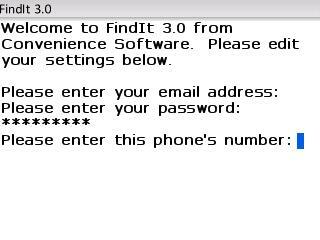 I've been lucky enough to test the new beta version of GetItBack (formerly FindIt 2.0) from Convenience Software. The app resides in the background and automatically starts when you power up your device. The idea behind the app is simple - if your smartphone is lost or swiped, you simply login to their one page web interface and report it "Stolen". From there you have multiple options to activate your BlackBerry's alarm & ringer, send a custom message to the phone (I'm a member of the CrackBerry army!! Return my phone or pay big!!) and activate a callback to a number of your choice. The page also displays SIM information, tells you the last time your phone's backlight was activated and displays remaining battery life. More options are in the works during the private beta. 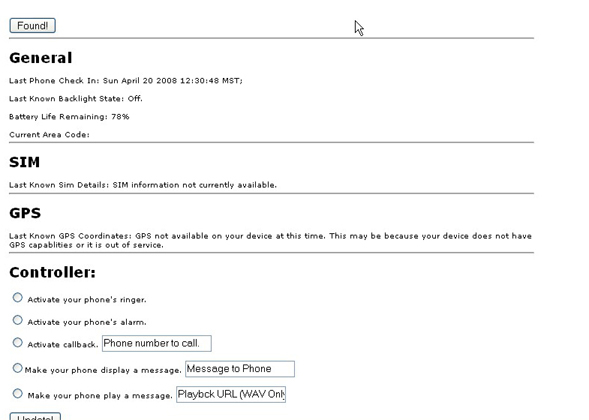 The GPS feature will be enabled, as well as the site sending an email to your phone as soon as you report it stolen. The coolest feature will be the ability to record a custom audio file that will sit on the server, and when the phone is reported stolen, the message will play over and over again. All in all some good stuff here. Pricing isn't available at the moment, but it should hover around the $4.99 price point of earlier versions. If you don't want to wait for GetItBack (aka FindIt 3.0), you can check out version 2.0 today - it's a solid and easy to use app as well.